For many car dealers, one of the sea-changes of the last ten years or so is the emergence of the Internet Car Buyer… not just the one who researches online, but the one who goes on to fulfil and complete on a sale, often without visiting the showroom. Of course, it’s been said that there aren’t many buyers like this, but you only have to look at the evidence presented to dealers – both in terms of sales into and out of territory, as well as the growth in numbers of online suppliers – to realise that whilst the overall level of interest in new cars is arguably declining, the online car buyer is on the increase. With CarQuake at the cutting edge of online car buying: being the UK site with the most efficient means of buying a new car. We see both ends of the spectrum – from the car buyer who wants a smooth and easy path to a new car to the dealer who wants to take more control over their marketing. 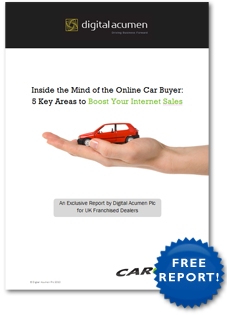 So, in order to help dealers serve customers better – both for their benefit and for the benefit of future buyers – we have prepared a report offering a detailed look at the Internet Car Buyer and how best to serve them and gain additional sales business. So, if you’re a franchised dealership and you want to take advantage of this exclusive report, then please contact us. And just ask for the ‘Car Buyer Report’ in the message field… and we’ll send you this report and keep you informed of any other key developments in the field of Internet Car Buying.